Neu, Museums Ausführung, Steam 4-8-4 Northern Powered, w/Sound/DCC Ready, Limited Run. Ist zu Reperatur zwecken seit März 2015 bei Ferdi Rat. Sie ist endlich nach langem wieder zurück von Ferdi Rat. Er musste sie komplett neu Programieren. The Atchison, Topeka & Santa Fe Railway during the administration of Edward H. Ripley (who oversaw its rebuilding during his 1895-1920 term as president) was a pioneer in the introduction of improved steam locomotives. The AT&SF originated the 2-10-2, appropriately named the Santa Fe type, in 1903; the 4-6-2 Pacific was adopted almost simultaneously, in 1903-1904. When all-steel consists dictated heavier passenger power, the Santa Fe acquired two 3700 class 4-8-2 or Mountain type engines in 1918. The evolution to 4-8-2's occurred on the Santa Fe in 1927. In almost all these cases, the Santa Fe acquired the improved power years before other western railroads. The AT&SF paid Baldwin Locomotive Works $ 99,712.77 for No. 3751, the thirteenth 4-8-4 of 892 constructed between 1926 and 1950 for U.S. railroads. A joint design effort of Santa Fe Mechanical Engineer Howard H. Lanning, his staff, and Baldwin, Santa Fe's first 4-8-4 was a mixture of conservative design and the best locomotive technology of that time. Boiler pressure was set at only 210 pounds, even though many engines had been set at 250 pounds since 1917. Modern features included cast steel cylinders keyed to the engine bed, front-end American multiple throttle, Elesco feedwater heater, Duplex stoker, Nicholson thermic siphons in the firebox, which had a large grate of 108 square feet, and the Type E high-temperature superheater. Walschaert valve gear with a multiplying lever to provide 9" of maximum valve travel, operated with a Ragonnet power reverse gear, was provided. The Santa Fe's own Layden exhaust nozzle was used. Tenders had a one-piece cast steel underframe, used six-wheel trucks, and held 15,000 gallons of water and 20 tons of coal. The 30"x30" cylinders resulted in high back-pressures at higher speeds, resulting in a decrease in the expected horsepower output. The 73" drivers were a good compromise for an engine used on both mountain and level territories, at a time when passenger train speeds seldom exceeded 65 miles per hour. The total engine weight of 421,000 pounds was only about four tons heavier than the heaviest 3800 class 2-10-2s but enough to make No. 3751 the largest engine on the system in 1927. Tested against 4-8-2 No. 3714 between La Junta and Albuquerque, No. 3751 demonstrated savings of 19.4 percent in coal consumption while increasing water evaporation per pound of coal by 43.4 percent. It could handle 26 all-steel cars on level track and 15 on two-percent grades. Maximum drawbar horsepower at 40 miles per hour was 3,220 with indicated or cylinder horsepower of 3,600 at that speed. No. 3751 entered into passenger service on this difficult New Mexico division, with grades of 3.5 percent westbound and 3.3 percent grades eastbound over Raton Mountain (where 2-10-2 helpers were employed). Performance as compared to the 4-8-2s was so marked that Santa Fe ordered nine additional 4-8-4s, Nos. 3752-3760, which were delivered in early 1928; four more, Nos. 3761-3764 followed in 1929. The 14 engines were assigned to a La Junta-Winslow passenger pool, over 636.5 miles, with engines cutting out at Albuquerque for boiler wash and inspections when required. Five daily trains in each direction were handled, including the crack Chief, the all-Pullman California Limited, the Fast Mail Express, the Grand Canyon Limited, and the Navajo. Depression-era reductions in passenger train mileage saw four trains each way via La Junta, making the 4-8-4s available for trains No. 9 and No. 22 between Winslow and Clovis, 503.5 miles. The May 1936 inauguration of the diesel-powered Super Chief and the need for relief steam power put No. 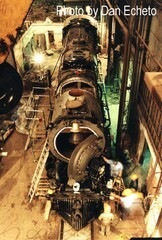 3751 in the San Bernardino shop for conversion to burn oil, which was completed in December. A 5,071 gallon oil tank was fabricated for the coal compartment in the tender, and the engine was assigned to operate between Winslow and Los Angeles. On the days the weekly Super Chief operated, No. 3751 was held at one intermediate engine terminal for possible relief. Through engine runs were established between La Junta and Los Angeles effective December 7, 1937; No. 3751 was put on this run, alternating with 11 new 4-8-4s (Nos. 3765-3775) when they were delivered beginning in April 1938. This 1,235-mile run was the longest steam engine assignment in the country at that time. In 1938 the Santa Fe began an upgrading program on ten of the fourteen 4-8-4s. New 80-inch Boxpok driving wheels were applied, along with Timken roller bearings on all engine axles. The Elesco closed type feedwater heaters were replaced with Worthington 6-SA open type on the last four engines, which were out shopped at Albuquerque during 1941. No. 3751 was the next to last to be improved, leaving the shop on August 30. 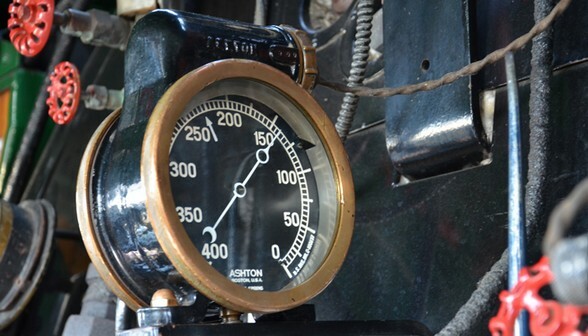 With steam pressure raised to 230 pounds, the maximum drawbar horsepower was 3,600 at 50 miles per hour, with 3,900 indicated horsepower at that speed. Increasing the size of the steam passages to and from the cylinders overcame part of the high back-pressure problem of the engine as built. A maximum speed of 90 miles per hour was permitted with the rebuilt engines, although documentation shows that No. 3751 exceeded 100 miles per hour several times. The original 4-8-4s had been handling the Grand Canyon Limited between Los Angeles and Wellington, Kansas (1,534 miles) since January 1940; upon completion of its rebuilding, No. 3751 entered this pool. Operating requirements sometimes saw No. 3751 on a La Junta-bound train out of Los Angeles, but after delivery of the 10 newest 4-8-4s, Nos. 3776-3785, in the summer of 1941, this became less frequent. 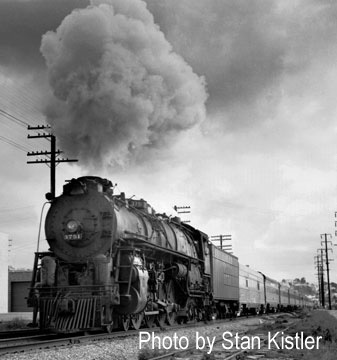 Effective May 23, 1942, the original 4-8-4s started running through from Los Angeles to Kansas City via Amarillo, a distance of 1,789 miles, setting a new record for through steam locomotive runs. During World War II, these engines handled both the Scout and the Grand Canyon Limited. On-time performance was not the best with the long stops to work heavy mail and express, but seldom was one of these engines cut out at an intermediate terminal due to failure. During the typical month of August 1943, the 14 engines averaged 18,435 miles per locomotive with a repair cost of 23 cents per mile, at a time when 3,600-horsepower diesels handling lightweight trains cost 32.4 cents a mile for repairs. The larger 2900 class 4-8-4s built in 1943-1944 were assigned to the Scout and Grand Canyon Limited on September 23, 1945, when the end of the war permitted them to be spared from freight work. New passenger diesels started arriving in the fall of 1946, so 10 of the original 4-8-4s were shifted to freight service west out of Argentine yard, Kansas City, primarily to Waynoka, Oklahoma, and sometimes through to Clovis, New Mexico, a 637 mile district. No. 3751 retained its status as a passenger engine and was assigned to the Arizona division on trains No. 23 and No. 24, the Oakland section of the Grand Canyon between Barstow and Bakersfield, over the Tehachapi Mountains. Height restrictions at the numerous tunnels on this route resulted in the extension smokestack being replaced with a lower deflector type. In 1950, No. 3751 was equipped with automatic train-stop equipment. That year also saw the last class 3 general overhaul for No. 3751 at Albuquerque; upon its release, it was assigned to the Los Angeles division. Working out of the Redondo Junction roundhouse, No. 3751 protected extra sections and special trains to Barstow, served as passenger helper out of San Bernardino, and handled the Del Mar Race Track trains and locals 75-70 between Los Angeles and San Diego. When a diesel was out of service, the 4-8-4 would handle the streamlined San Diegan trains, on time. Class 5-H repairs were made at Albuquerque in December 1951 and December 1952, and upon its return to Los Angeles, No. 3751 ran 3,954 miles in January and February 1953. 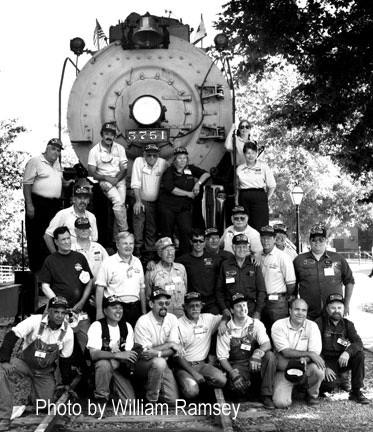 March through June saw it stored serviceable, but the pioneer 4-8-4 was returned to service in July to assist in a heavy movement of special trains to and from the Boy Scouts' encampment at Santa Ana. After covering 5,319 additional miles, it was laid up at Redondo Junction on August 23, 1953. A 26-year career as a passenger locomotive was finished. Always dependable, No. 3751 didn't owe 'Uncle John' a dime when it completed its last mile in regular service. The 3751 was a pioneer 4-8-4 locomotive for both the Santa Fe Railroad and the Baldwin Locomotive Works. As such, extensive testing was done on the locomotive during its first years on the railroad. The first set of mechanical articles presented below were taken from the June 2, 1928 issue of "Railway Age" and written about the 3751-class prototype locomotive (#3751) after its first year of active operation on the Santa Fe Railroad. The second set of articles are from the September 1939 issue of "Railway Mechanical Engineer" and focused on the overhauls performed on the 3751-class locomotives. With the principal object of handling heavier passenger trains faster and with less unit fuel consumption, the Atchison, Topeka & Santa Fe designed and placed in service during the past year, 10 modified Mountain type coal-burning locomotives of 4-8-4 wheel arrangement, known on the Santa Fe as the 3751 class, and numbered from 3751 to 3760 inclusive. These locomotives, built by the Baldwin Locomotive Works, are of the two-cylinder single-expansion type, equipped with 30 in. by 30 in. cylinders and 73 inch driving wheels, and develop 66,000 lb. tractive force at a boiler pressure of 210 lb. without the aid of a booster. The new locomotive is notable for high boiler capacity, evaporating in one test an average of 6.74 lb. of water per lb. of coal when burning low-grade Colorado mine run at the rate of 4,125 lb. of coal an hour. The combustion chamber firebox, with a total grate area of 108 sq. ft. and round-hole table grates, is designed to assure a low rate of firing per sq. ft. of grate area and as nearly complete combustion as practicable before the gases pass into the flues. In order to accommodate this large firebox, a non-articulated four-wheel trailing truck, which has been in the process of development on the Santa Fe since 1919, is applied. Driving axle loads up to 70,600 lb. are used on certain pairs of wheels, yet without excessive rail stress on either tangent track or curves, due to careful spring equalization, proper counterbalancing of the reciprocating and revolving weights and cross counterbalancing the revolving weights on the main wheels to offset the effect of these weights moving in different planes. Operating results secured with the 3751-class locomotive under actual service conditions have exceeded the expectations. This locomotive has demonstrated the ability to start 26 cars of heavy modern equipment on level track, or 15 cars on a 1.13 per-cent grade, in the latter case accelerating to a speed of 20 to 25 miles per hour in a distance of 15 car lengths. In the mountain country of Colorado, New Mexico and Arizona, the locomotive handles 15 cars over grades up to two per cent and 9 cars over the 3 1/2 per-cent grade of the Raton Mountains, without a helper. Sixteen-degree curves can be negotiated. The locomotive is said to handle easily, accelerate rapidly and ride easily, especially on curves, which the locomotive is designed to pass with a minimum of flange and rail stress and nosing. In general, because of slack business, the new locomotives have not been operated to full capacity since being placed in service and, consequently, maximum results with respect to fuel economy could not be expected. A good indication of their performance is afforded, however, by the results of comparative tests of locomotive No. 3751 and locomotive No. 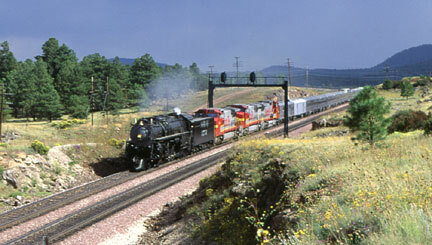 3714, a previous Santa Fe Mountain type locomotive, on the 347.5 mile run between La Junta, Colo., and Albuquerque, N.M. These tests were made during the latter part of 1927, operating in both directions between the two points mentioned. It will be noted that locomotive No. 3751 handled four more cars at a slightly higher average speed than No. 3714. It handled, on average, 33 per cent more tons per train and developed a proportionately greater number of ton-miles. In making comparisons of fuel consumption, consideration must be given to the fact that locomotive No. 3714 is not equipped with a feedwater heater and accordingly, should be credited with about 10 per cent better performance. The balance of the improvement shown by locomotive No. 3751, however, is due to improvements in design, and amounts to a saving of roughly one-third of the fuel per unit of work which locomotive No. 3714 consumes under the most favorable circumstances. It will be noted that locomotive No. 3751 evaporated an average of 930 lb. of water and burned 138.6 lb. of coal per 1,000 ton-miles, or at the rate of 6.74 lb. of water per lb. of coal during these tests. All tests were made burning Colorado and New Mexico mine-run coal on round-hole table grates with 16-per-cent air openings. As a result of studies made on the Santa Fe during the past few years with a view to determining the wheel loading, distribution of weights and method of counterbalancing which will keep track stress within safe limits, a loading of trucks and driving axles of locomotive No. 3751 was adopted. For purposes of comparison, the wheel loads of locomotive No. 3710, a previous Santa Fe Mountain type locomotive, are also compared. All of the driving wheels on locomotive No. 3751 have flanged tires, and no driving box lateral motion device is provided. The tires on No.1 and No. 4 wheels are set 1/8 in. nearer together than on the main and No. 3 wheels. Three-eighths inch lateral motion is provided on the front truck wheels, 3/16 in. on all drivers and on the forward trailer truck wheels, and 3/8 in. on the back wheels of the trailer truck. In general, the maximum static loads were kept to 70,000 lb. per axle and the combined static and dynamic loads to 76,000 lb. per axle. The effectiveness of this design, together with accurate cross counterbalancing and a division of the trailer-truck load between two axles, has been such as to permit increasing driving-axle loads almost 10,000 lb. in locomotive No. 3751 as compared with locomotive No. 3710 and at the same time to develop lower peak track stresses. The comparative effects of these two locomotives on tangent track at 60 miles per hour are plainly shown in Chart I which gives the equivalent static load on each pair of drivers through a complete revolution. A glance at the chart shows that in locomotive No. 3751, the No. 1 driving wheels have been made to take more nearly a fair share of the equivalent static load than was the case with locomotive No. 3710, and as a result, the main and particularly the No. 3 wheels have been relieved of excessive loading. The chart shows that locomotive No. 3751 at 60 miles per hour on tangent track provides about 3,000 lb. less maximum equivalent static load on the rails than locomotive 3710, in spite of having from 9 to 15 per cent greater individual driving axle loads. The stresses in both rails occasioned by locomotive 3751 passing a 10-deg. curve at three different speeds are examined. In general, the comparison indicates that the loads are fairly well distributed between the driving wheels and trucks under all curve and speed conditions; at least excessive peak loads from any one pair of wheels are avoided. Similar comparisons to those reproduced here for locomotive No. 3751 were developed for locomotive No. 3710 and published in the 1926 proceedings of the American Railway Association, Mechanical Division. In fact, the results of the tests reported at that time served as the basis for the distribution of the wheel loads in the present locomotive. To illustrate how peak rail loads have been avoided by the design of locomotive N. 3751, a reference to the diagram for locomotive N. 3710, published in 1926, shows that at five miles an hour the No. 3 driving wheels cause a stress of about 46,000 lb. per sq. in. on the outside edge of the base of the inner rail on a 10-degree curve. With locomotive No. 3751, this stress at the slightly greater speed of 10 miles an hour has been reduced to 32,000 lb. per sq. in., as indicated in Chart II. At 25 miles an hour on the same curve, the No. 3 wheels of locomotive No. 3710 cause a maximum rail stress of about 35,000 lb. per sq. in., whereas the No. 3 wheels on locomotive N. 3751 cause a stress of only 32,000 lb. per sq. in. The records show that the trailer wheels of locomotive No. 3710, in passing a 10-deg. curve at 25 or more miles an hour, introduce a stress in excess of 40,000 lb. per sq. in. in the outside edge of the base of the outer rail. The trailer truck design on locomotive No. 3751, with the division of the load between two axles and a substantially shorter distance between the No. 4 driving and No. 1 trailer wheels, overcomes this difficulty. In conjunction with the desire for high capacity, fuel economy, and reduced track stress, an effort has been made in the design of the Santa Fe 3751-class locomotives, to produce a type which requires less maintenance expense than some of its predecessors. Although no definite figures are available, this has undoubtedly been accomplished to a considerable degree, since locomotive design which reduces the destructive effect on track and roadway must necessarily involve the equalizing of unbalanced forces in the locomotive structure itself and consequently reduce wear and tear and resultant maintenance. The 3751-class locomotive is equipped with one-piece cast steel cylinders and a separately cast Commonwealth bed frame. A Type E superheater with American multiple throttle is installed, also Nicholson thermic siphons in both the firebox and combustion chamber. The Elesco feedwater-heater installation includes a centrifugal pump designed to avoid pulsations which, under certain conditions, accentuate foaming difficulties. Other equipment on this locomotive includes the Ragonnet power reverse gear, Walschaert valve gear with multiplying lever to give nine inches maximum valve travel, Layden four-ported exhaust nozzle, 25 1/2 in. diameter smokestack and insulated smokebox. An auxiliary dome, just ahead of the main steam dome and slightly to the left of the boiler center line, carries the safety valves and affords entrance to the boiler without removing the dry pipe. Dual sand boxes and equipment, including Graham-White sanders, give ample capacity and reliability for long distance mountain runs. Locomotives Nos. 3752 to 3756 inclusive, have Dupont stokers and Franklin butterfly fire doors. 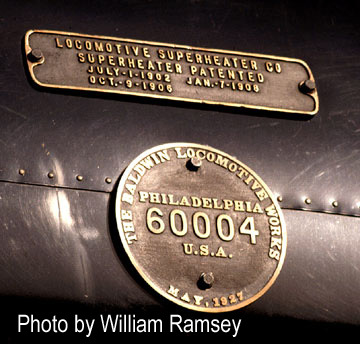 Locomotive Nos. 3751 and 3757 to 3760 inclusive, have Duplex stokers and Franklin vertical lift fire doors. Alloy steels are used to a limited extent in the construction of these locomotives. The main driving wheel centers are of high tensile strength steel. The hollow main crank pins, as well as the piston rods, are made of oil-quenched and tempered chrome-nickel steel. Main and side rods and crank pins, other than the main, are carbon steel, normalized. Steam-pipe and superheater bolts in the smokebox are made of chrome-nickel steel, heat treated. Phosphor-bronze driving box brasses and nickel-bronze floating rod bushings are used. The locomotive tender is constructed with a Commonwealth one-piece cast steel underframe having end sills cast integral and designed to accommodate the Franklin unit drawbar arrangement. Six-wheel trucks are applied, with cast steel side frames having riveted liners on the pedestal wear faces. Tatum-Zell type journal boxes are used. The tender has a capacity for 15,000 gal. of water and 20 tons of coal. The general dimensions of the new locomotive, as compared with a previous mountain type locomotive. The cylinders of the 3751-class locomotive are combined in a one-piece steel casting representing a saving in weight of approximately 25 per cent over cylinders of cast iron. This steel cylinder casting is bolted and keyed to a locomotive bed and cradle frame cast of steel in one piece, with separate steel front deck casting in order to facilitate repairs in case of accidental collision. The steam and exhaust passages of the cylinders are designed free from restrictions and obstructions to the flow of steam. The exhaust passages are gradually reduced in area from the valve bushings to the base of the exhaust pipe in such a way that the cross section at no point is larger than a preceding section. All fillets have at least ' in. radius. The front engine truck is of the constant-resistance type with Commonwealth cast-steel frame, 33-in. solid rolled steel wheels, and 6-in. by 11-in. journals. The trailer truck is of the four-wheel Delta type with constant-resistance rockers and has a one-piece cast-steel frame. Both pairs of trailer wheels are 40 in. in diameter, the journals being 9 in by 14 in. Brass pedestal wearing liners are riveted to the truck frame. The driving wheels are 73 in. in diameter, and in order to apply a boiler of the desired diameter and capacity, it was found necessary to use driving springs with reverse camber. The driving wheel centers are 66 in. in diameter and mounted on hollow-bored axles, the main axle being 13 in. in diameter and the others 12 in. The main crank pin is also hollow-bored with a four inch hole to reduce weight and provide for delivery of grease under pressure to the center of the main and side rod floating bushings. Flange tires are provided on all driving wheels, spaced as follows: Front wheels, 53 1/8 in. ; main wheels, 53' in. ; No. 3 wheels, 53' in. ; No. 4 wheels, 53 1/8 in. Revolving weights and 50 per cent of the reciprocating weights are counterbalanced, revolving weights in the main wheels being cross-counterbalanced. The static and dynamic load on these wheels is kept under 76,000 lb. per pair of wheels. The driving boxes have a bearing 13 in. long on the journals and are equipped with phosphor-bronze brasses with babbitt inserts and Elvin grease cellars. The shoes and wedges are also made of phosphor bronze. The normalized carbon-steel main rods have floating bushings on the back ends and front ends tapered to prevent galling in the reinforced Laird type crossheads. Grease cups are forged solid with the rod and off center to give a stronger construction. Pistons are of the Universal three-bull-ring type. Walschaert valve gears are supplied with an additional lever interposed between the radius rod and combination lever and pivoted at the rear end of the back valve cylinder head. This arrangement, covered by a patent application, magnifies the motion produced by the link but does not affect the motion produced by the combination lever and affords a longer valve travel than usual with Walschaert gear without exceeding the normal limits of angularity. The maximum travel obtained is nine inches, and in order to take full advantage of this travel and permit finer adjustments of cutoff, the Ragonnet power reverse gear is operated from the cab by a reverse lever and quadrant cut with more than the usual number of teeth. The boiler of the new locomotive is designed for a minimum safety factor of four with a boiler pressure of 225 lb. It is of the wagon-top type, with conical barrel, the rear course of which is 99-15/16 in., and the first course 88 in. in outside diameter. The firebox has a grate area of 108 sq. ft. and is equipped with two 3' in. arch tubes, and two Nicholson thermic siphons. The combustion chamber is equipped with one thermic siphon. There are 221 superheater flues, 3' in. in diameter by 21 ft. long; and 59 tubes, 2' in. in diameter and of the same length. All of the superheater flues are electric welded to the back flue sheet and beaded in the front. The wrapper sheet for this boiler is made in three pieces. The firebox and combustion chamber sides and crown sheet are also made in one piece and welded. The cast steel mud ring, double-riveted throughout, is arranged with a pad 1 in. thick to the underside of each corner and welded, inside and out, 12 in. each way from the corner. All firebox seams also are welded 50 in. up from the bottom of the sheets. Flannery flexible staybolts with universal sleeves are used in the breaking zones and completely around the combustion chamber, these bolts being hollow and arranged for electric testing. In addition to the main steam dome, pressed from a single piece of openhearth steel, an auxiliary dome is located ahead of the main dome and far enough to the left of the boiler centerline so that the 9' in. inside dry pipe will not prevent entrance to the boiler for inspection or other purposes. The smokebox is of the extended type, 89' in. in outside diameter, with a pressed-steel front-end door and door ring hinged to the smokebox by an Okadee front-end hinge. The Atchison, Topeka & Santa Fe has converted ten heavy 4-8-4 type steam locomotives, known as the 3751 class, at its Albuquerque, N.M., locomotive shops. These locomotives were purchased from Baldwin in 1928. They were originally stoker-fired, but a few years ago were changed to oil and this fuel continues in use. They will run through between La Junta, Colo., and Los Angeles, Cal., 1,235 miles. The conversion was completed in July. 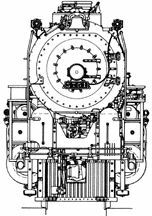 The conversion work includes the following: Timken roller bearings applied to all wheels; new and longer smokebox applied; dome closed by inside cap, riveted in place; feedwater heater raised to smokebox location; reciprocating feedwater pump located under left side of cab; pressure raised from 220 to 230 lb. ; two extra backhead braces and two extra flue sheet braces applied; size of radial stays around syphons increased; reinforcing pads riveted to barrel and smokebox; all rods new including tandem main rods, and new valve motion. The frames are the Commonwealth locomotive bed type. The pedestal jaws are straight to accommodate the Timken bearing housings that require no wedge, but use bronze-faced shoes between the frame and housing. In accordance with modern practice, the power reverse gear and air reservoirs are supported from the frame. The brackets for the latter are bolted to the frame and the bracket for the power reverse is included in the link bearer casting. The two belly braces are the floating type and the T-irons bear against heavy reinforcing pads riveted to the shell. The upright sheets of these braces are riveted to the T-irons and bolted to the integral cross members of the frame bed. There are three swing braces connecting the boiler and frame on each side. Two of these are on the smokebox and the other is on the shell. In stripping, the boiler is cut loose from the cylinder saddle by burning off the heads of the bolts in the smokebox and burning out the part of these saddle bolts that extends through the smokebox. The heavy boiler work is done in the boiler shop. The original cast-steel cylinders are retained in the new design. The increase in pressure from 220 to 230 lb., necessitates two additional backhead braces and two additional back flue-sheet braces, and at this time the size of the radial stays around the siphons was increased to 1 3/16 in. body size. The original front-end throttle arrangement is unchanged and after the dome is permanently closed, entrance to the boiler is effected through an auxiliary dome. The original dome cap was slightly modified in shape (for clearance) and was placed inside the dome. The old stud holes in the dome are reamed and the cap riveted and caulked without the use of a gasket. This work was done while the flue sheet was out. The increase in the length of the driving-wheel base to accommodate the 80-in. drivers makes a longer boiler necessary and a new smokebox 11 ft. long was rolled and applied in the local shop. New main steam pipes necessary between the superheater header and cylinders are several feet ahead of their former position in reference to the front flue sheet. There is little change in the draft appliances. An open-type spark arrester originally developed for coal burners by the Santa Fe test department is used with slight changes on oil burners, including the locomotives of the 3751 class. Two outstanding additions in this connection are the change to tandem main rods, and the use of the Franklin Railway Supply Company's patented lateral-motion device on the front drivers, made necessary on account of the long driving-wheel base. The front drivers have 3/8 in. total free lateral, and an additional movement of 11/16 in. in either direction, against spring action, is provided by the device. The necessary slack for this movement is provided between the roller-bearing housing (boxes) and the shoes. The lateral device centers the wheels by two rollers that extend through slots in the respective spring saddles. Each roller is mounted in a block which forms the inside saddle seat and the roller bears against part of the frame. The thrust of the wheels in rounding a curve is transmitted to one of these rollers which slightly tips the spring saddle against the resistance of the driver spring. The front end bushings have a spherical bearing in the rod to assure alignment. This device is also used on the front drivers of locomotive 5000, and many features of Santa Fe design that proved so successful on this locomotive are incorporated in the new design for the present conversion. It is interesting to note that a new method has been developed for laying out the shoes which is different from the ordinary procedure in connection with shoes and wedges. This consists of squaring the frame in the usual way and locating accurately machined bars across the pedestal openings in the positions the axles will occupy. These bars are secured by small bolts to the spreaders that span the frame-jaw openings. The bars are adjusted square and in tram and the shoe thickness figured by measuring from the bars to the pedestal faces with micrometers. No prick punch marks are made on the shoes (which are not in place), but the milling-machine operator is supplied with dimensions in thousandths for each end of each shoe. The locomotive beds are accurately machined by the manufacturer and before the laying-out operation the distance between jaws is checked by offset measuring rods. The slight irregularities are corrected by filing and grinding and the jaws are spot faced. The shoes show little difference in size when finished. Application of roller bearings in the shop is new for the Santa Fe and is an important addition and betterment. New tenders were applied to the 3751 locomotives at the time of change to oil and these had roller bearings as supplied by the builders. The present construction includes roller bearings for engine trucks, trailers, and drivers. Doing this work in the railroad shop requires the introduction of new standards of accuracy. Plus or minus .0015 in. is a common notation on the axle blueprints, and such close tolerances on the dimension of the cone-backing shoulders on axles require the use of special gages. These are the template type, made by Browne and Sharpe. One of these gages has its length stenciled 37.953125 in. A full set of inside and outside micrometers up to 14 inches is used at the axle lathe. The axles are of Timken design with liberal-radius fillets, and the wheel fit is smooth turned and polished for an inch or more inside the hub where experience and the Timken tests show that fatigue cracks develop. The fits for the bearing cones on the journal portion of the axle are ground on a Landis grinder. Several new wheel-press jibs and fixtures are necessary to mount these bearings. For mounting outside journal truck bearings, a pilot sleeve is provided which fits over the axle stub. (About 1' in. at the end of the axle is reduced in diameter and takes a press fit collar). This pilot keeps the cone square as the fit enters. Heavy press fits on roller-bearing parts are not necessary or desirable. The thrust developed in rounding curves is transmitted to a shoulder on the axle, and unlike a wheel, the bearing parts do not depend on the fit alone to hold them in position. In mounting these parts little attention is paid to tonnage except that a maximum of 25 tons is mentioned. The fit allowance is carefully checked with micrometers and the proper amount of interference with .001 in. plus or minus is maintained. Castor oil and white lead are used as a lubricant on roller-bearing fits. The exact procedure for mounting a Timken trailer bearing on outside bearings is as follows: For shipment the parts are covered with a light coat of oil. Before mounting, this protective coating is removed by washing the parts in distillate. The mounted wheels are placed in the wheel press as if the axle were to be pressed out. The enclosure (inner portion of housing) is placed over the axle against the hub with the bolts in place. This enclosure has four grooves on the inside which act as an oil seal and these are filled with valve oil to assure initial lubrication before the enclosure is applied. The oil flinger that supplements the seal is pressed in place. A freely fitting sleeve is used to press on these bearing parts. This sleeve has a spherical cap on the end toward the press ram to equalize pressure and prevent cocked the fitted parts. The first roller-bearing assembly, which includes the cone, rollers, and the flinger, is then pressed on, using the pilot fixture mentioned in a previous paragraph to start it straight. The cone spacing ring is applied next, and then the second roller bearing, after the cups are placed in position. The collar is then pressed on the end of the axle. The cup-spacing ring is in halves which may be fastened together by wire until the housing is slipped in place. It is interesting to note that the rollers are within .0001 in. of the same size, and this size is etched on the large end of each roller. To check the lateral of the roller bearing, a dial indicator is used. The axle (inside journals) is turned on end preferably before the wheels are mounted and the bearing housing raised to the limit of its free motion. The load is released and the housing jarred down with a soft sledge. The dial indicator is clamped by a hand around the axle and indicates the lateral movement of the housing in thousandths. Press fits on the Santa Fe are lubricated with mineral paint (box car red) mixed with boiled linseed oil. A gallon of oil is used to thin 18 lb. of brown semi paste, which makes it about as thick as a priming coat of paint. This is prepared fresh each week, and is applied just before the parts are pressed together. The method of counterbalancing at Albuquerque is essentially the same as followed in other large shops and locomotive works. The Boxpok main wheels have riveted plates covering the outside of the counterbalance space. These wheels are filled with lead before being mounted, while flat on the floor, and the lead is pounded with a long stroke riveting hammer to tighten it after it cools. All the wheels except the mains have solid steel counterweights, and three 3' in holes are drilled in the back of these for slight adjustment of the balance. The main wheels have cored holes in the back of the balance for the same purpose. The main wheels and intermediate wheels are cross-balanced, 8 deg. and 59 min. on the main and 5 deg. and 59 min. on the number three. The counterbalances are off center this amount toward the opposite pin. When on the balancing strips, with the counterbalances perfectly adjusted, and the correct weight hung on the opposing pin, the main pin will be 27/16 in. out of plumb and the number three pin will be 1 11/16 out of plumb. After a while with a few trials it was possible to machine the wheels so accurately that changes of less than 50 lbs. (at pin radius) were required. 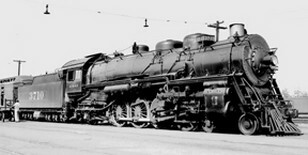 4-8-4 3751 Class, 14 engines built 3751-3764. 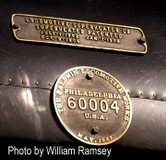 Baldwin Locomotive Works, Philadelphia, PA. Passenger and Freight (Dual Purpose). 73" from 1927 to 1941, 80" from 1941 to present. Engine 478,100 lbs., Tender 396,246 lbs., Total 874,346 lbs. Engine and Tender 108' 7"
66,000 lbs. as built, 71,719 lbs. currently. Boiler - 5,000 hp, Cylinders - 3,900 hp, Drawbar - 3,600 hp. Coal 1927-36 (20 tons). Oil 7,101 gallons 1938-present. 15,000 gallons 1927-1938, 20,000 gallons 1938-present. 105 freight cars, 5,949 tons, level grade, 45 m.p.h. 70 m.p.h. for 1927-1938. 90 m.p.h. for 1941-1953. LA to La Junta, CO 1,235 miles. LA to Kansas City, KS 1,789 miles. LA to Wellington, KS 1,535 miles. Bitte auf Bild KLICKEN für grössere Ansicht! Santa Fe Railway, in cooperation with Baldwin Locomotive Works, designs Santa Fe's first 4-8-4, as a coal burner. In May, 3751 emerges from the erecting hall as the Santa Fe's and Baldwin's first 4-8-4, builder's number 60004. Tests show 3751 to be 20% more efficient and powerful than Santa Fe class 3700 4-8-2's. 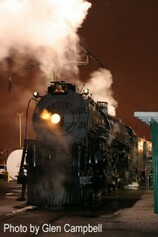 3751 is converted to burn oil at the San Bernardino Shops. 3751 hauls the first named passenger train 'The Scout' into the new Los Angeles Union Passenger Terminal on opening day, May 7. 3751 completes it's modernization for high speed operation with a new frame, 80 inch drivers, and roller bearings all around, along with other upgrades. It's highest recorded speed was 103 miles per hour. 3751 pulls the last steam powered passenger train from San Diego on August 23, the engine's last revenue run before being stored serviceable temporarily at Los Angeles' Redondo Junction Roundhouse. 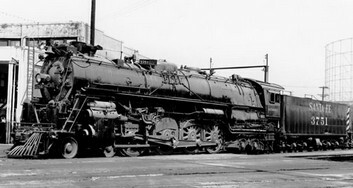 3751 is placed in Viaduct Park, San Bernardino as a static display May 14, 1958. 3751 becomes the oldest existing 4-8-4 as the first 12 built by Alco are scrapped by the Northern Pacific - as that railroad fully dieselizes. 3751 is sold to the SBRHS by the city of San Bernardino for $1, with conditions - the SBRHS must restore and operate the locomotive. With the help of volunteers, the Santa Fe and a lot of panel track 3751 is moved out of Viaduct Park on April 30, and into California Steel Industries in Fontana, where the majority of restoration is performed (Please see Restoration Gallery). 3751 returns to steam on August 15. December 20 is the official Christening and Dedication Ceremony for the 3751 as she is returned to steam, the newly restored locomotive pulls a freight train from San Bernardino to Los Angeles as a break in run. 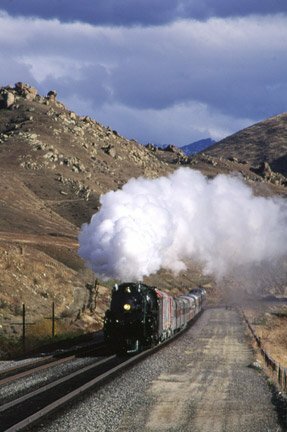 The California Limited Excursion operates December 27-30 from Los Angeles to Bakersfield and return via Cajon and Tehachapi passes (Please see California Limited Gallery). 3751 pulls the Santa Fe Railway Employee Appreciation Special, August 30 to September 16, Los Angeles - Chicago - Los Angeles (Please see E.A.S to Chicago Gallery). On April 21 the 3751 is the last locomotive serviced at the Santa Fe's San Bernardino Yards Complex. Most of the 72 buildings in the yard complex will be demolished to make way for an intermodal facility. 3751 had been stored in the Car Shops of the complex, then the Santa Fe offered the SBRHS a siding between Lytle Creek wash and the Metrolink flyover just west of the Depot in San Bernardino - as a temporary home. 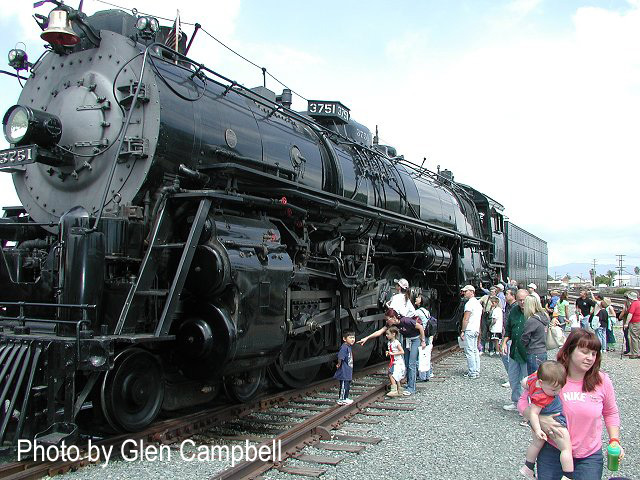 April 22-23 3751 is displayed under steam at Riversides 'Sunkist Orange Blossom Festival'. 3751 is again displayed under steam at Riversides 'Sunkist Orange Blossom Festival', in April. The siding that the Santa Fe provided as a temporary storage site needed to be vacated, the SBRHS negotiates a lease with Amtrak to store the locomotive and tool car in the Redondo Junction Roundhouse in Los Angeles. To physically get there 3751 pulls a BNSF train to Hobart Yard in Los Angeles on January 12, and is stored at Amtrak's Redondo Junction Roundhouse (Please see Move to Redondo Gallery). SBRHS signs a lease for museum property (east of Santa Fe Depot) in San Bernardino on April 21, but the lease is never signed by the San Bernardino mayors office. Displayed under steam for Amtrak employee picnic on May 1 at Redondo Junction. Attend CSRM's 'Railfair 99' June 18-27 (Please see Railfair 99 Gallery). 3751 becomes the last steam locomotive to be serviced at the Redondo Junction Roundhouse before it was dismantled by Amtrak in August (sound familiar?). 3751 is again stored outside in the elements, however Amtrak provides a huge tarp to cover the locomotive with during the winter. Yes, it does rain in southern California. On October 4, 2000, steam locomotive No. 3751 was listed on the 'National Register of Historic Places' (NR Reference Number 00001178). In May the locomotive participates in a local event in Fullerton, CA and is displayed hot for the weekend at 'Fullerton Railroad Days'. SBRHS begins the FRA recertification process for 3751. 3751 completes its rebuilding for a new 15 year FRA boiler recertification. 3751 pulls a flawless trip to the NRHS Convention in Williams, Arizona - August 19-25. 3751 is also 75 years young this year, and still running strong (Please see Canyon Rails 2002 Gallery). Volunteers are busy early this year and raise a new compound fence, reorganize the Reefer Car, and work to replace cylinder rings and valves with funds raised through the 'Presidents Challenge'. SBRHS reviews operational opportunities and new locations for a home - not in San Bernardino. SBRHS volunteers work to complete the cylinder work and prepare the engine for its scheduled trip to San Diego in September, which was cancelled as no insurance could be found, an attempt to reschedule is planned for the spring of 2005. Volunteers participate in fundraising events at Fullerton Railroad Days on May 5 and the San Bernardino Orange Show on May 24-26. 3751 is invited to participate in the re-opening of the San Bernardino depot after its extensive restoration process. SBRHS hosts their first Educational Outreach Program in San Pedro, California. 3751 appears at a private steam up at Los Angeles Union Station for Metrolink as they host the American Public Transportation Association (APTA) Annual Commuter Rail Conference on April 2-3. 3751 participates in a private steam up on April 30th for the Los Angeles Railroad Historical Foundation (LARHF) when they tour the locomotive at Redondo Junction during a Santa Fe retrospective in Los Angeles. The 3751 attends Fullerton Railroad Days on May 7-8. On June 23, the 3751 is steamed up and on display at Los Angeles Union Station for the Santa Fe Railway Historical & Modeling Society Convention. 3751 is rolled out for another edition of the Educational Outreach Program at Los Angeles Union Station of February 6-9 to the delight of 850 school children. Schools from Wilmington, Burbank, Los Angeles and San Pedro attended this event. 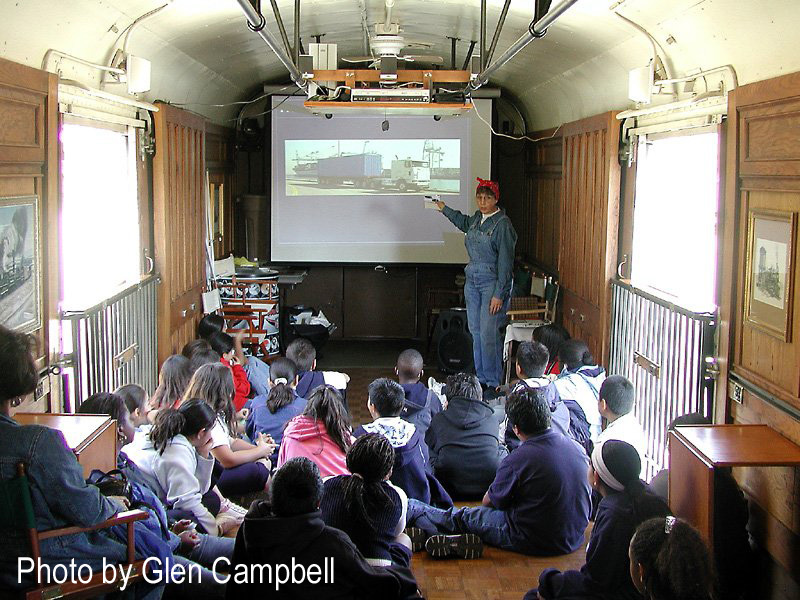 SBRHS hosts two more hugely sucsessful Educational Outreach Programs, the first is held February 11-17 at Los Angeles Union Station and the second being held in San Pedro April 15 to 22. Between these two events 3751 was visited by 1,550 school children during the SBRHS's Educational Outreach Program this year. On June 1, 3751 makes an historic return to San Diego for the first time in 55 years pulling an excursion train for the Central Coast Chapter of the National Railway Historical Society. In September, 3751 returns to San Diego for second time pulling the annual Amercian Association of Private Rail Car Owners (AAPRCO) excursion train. In May, 3751 is fired up for participation in the Amtrak Employee Appreciation Day at the Amtrak 8th Street Yard. 3751 and crew play host to Amtrak President Joseph Boardman, who tours the locomotive cab. 3751 participates in National Train Day and is put on display at Los Angeles Union Station. The weekend of May 1st and 2nd, 3751 takes an overnight train to San Diego and return. This is the third trip to San Diego in 2 years for 3751. The day before the trip, 3751 and crew again participate in Amtrak's Employee Appreciation Day at the 8th Street Yard in Los Angeles. 3751 travels to San Bernardino for National Train Day and the City of San Bernardino Bi-Centennial celebration. The weekend of April 16th and 17th, 3751 again travels to San Bernardino with a passenger train for the City's annual Railroad Days at the historic Santa Fe Depot. 3751 participates in National Train Day at Los Angeles Union Station. 3751 is steamed up and put on display at Los Angeles Union Station December 10 and 11 in conjunction with Amtrak's 40th Anniversary Museum Train. 3751's attendance helps make this event one of the most attended in the museum train's year long cross-country journey. The weekend of April 21st and 22nd, 3751 again travels to San Bernardino with a passenger train for the City's annual Railroad Days at the historic Santa Fe Depot. 3751 again participates in National Train Day at Los Angeles Union Station on May 12th. On Monday, May 14th, 3751 departs Los Angeles for a return to the Grand Canyon. Over six days the "Grand Canyon Limited II" travels over 1,300 miles as part of the Arizona Centennial Celebration. The successful trip is sponsored by the Central Coast Railway Club. 3751 is also 85 years young this year, and still running strong. 3751 is 85 years young this year and still running strong. 3751 steams to San Bernardino with a passenger train for the City's annual Railroad Days event at the historic Santa Fe Depot over April 20-21, sporting former Super Chief dormitory/lounge car Acoma, among other historic passenger cars. 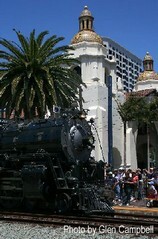 3751 is also displayed under steam for National Train Day on May 12 at Los Angeles Union Station. During this event, the SBRHS auctions an original painting of 3751, which was painted by local artist & career railroader, Eric Smith, whom donated this work to the SBRHS to be used as a fundraiser and basis of future merchandise. In late 2013, 3751 is brought out to Los Angeles Union Station as a backdrop for the filming of an episode of “Mob City." 3751’s whistle is recorded for use by Metrolink. For the 5th consecutive year, 3751 proudly steams from Los Angeles to San Bernardino and return with a five car passenger cars on April 12 - 13. The five cars included: a Metrolink Bombardier Bi-level coach wrapped in the company's "STAY ALERT - STAY ALIVE" red safety wrap, Amtrak's sole full-length dome car, the Ocean View, an Amtrak Amfleet coach, the ex-Santa Fe Super Chief lounge car, Acoma and the ex-Canadia National business car, Tioga Pass. This trip, apart of the city's annual San Bernardino Railroad Day's celebration, would mark the last trip 3751 could make to San Bernardino for at least two years as Metrolink began development of new track alignments at the jointly used Amtrak - Metrolink depot. With the full support of the Southern California Railway Plaza Association (SCRPA), the BNSF Railway and Amtrak - 3751 proudly returns to Fullerton Railroad Days after a seven year hiatus from the popular event. On the evening of April 30, the locomotive is towed backwards by the BNSF display unit also attending the event from Amtrak's 8th Street yard to Fullerton, arriving at its display location just after midnight. Following an entire day of preparations now at Fullerton, 3751 is warmly greeted by over 35,000 people during the two day event spanning May 2 - 3 before returning to Los Angeles on the evening of the 3rd. Also taking place at the beginning of 2015, the restoration of the future support car 1517 begins. The society's reefer box-car departs the SBRHS Redondo facility in late October and is moved to Anaheim. 3751's first steam up of 2016 finds it attending the California Passenger Rail Summit at Los Angeles Union Station on April 13th and 14th. A few short weeks later, the locomotive was again under steam and takes part in the annual Fullerton Railroad Days event on April 30th through May 1st. During the engine's display in Fullerton, the SBRHS conducts the society's first ever, closed night photography session. On the engine's return to Los Angeles, the SBRHS conducts a photo session of the display consist at the depot as it is the first BNSF - mainline steam movement to operate under the control of Positive Train Control (PTC). On July 28th, 3751 participates in Metrolink's unveiling ceremony for the new Tier 4, F125 unit at Los Angeles Union Station. Roughly a month later on the evening of September 27th, 3751 leads two leased BNSF units from Los Angeles Union Station to the Acton-Vincent Grade Station to participate the following day in Metrolink's dedication ceremony of a second platform here. 3751's 120-mile trip to Acton and return marked the first time a steam locomotive had traveled north of Los Angeles in 24 years and the first time in 32 years a steam locomotive traveled through Soledad Canyon. In early May, 3751 again steams to the annual Fullerton Railroad Days event. On the second evening of its stay, the SBRHS holds its second close night photography session that includes many reenactors and an original, WWII 1944-built Jeep. In mid-July, 3751 makes an appearance at the Summer Trainfest at Los Angeles Union Station. 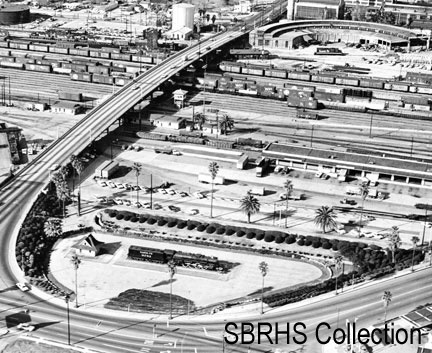 At the conclusion of this event, the SBRHS hosts the first formal, night photography session on the grounds of the Redondo turntable with 3751 posed in different angles on the table with reenacts and vintage vehicles. For its last outing of 2017, 3751 joins the second annual L.A. Union Station Holiday TrainFest & Toy Drive. Welcome to the 4-8-4 comparison page, where you can compare general specifications of currently operable 4-8-4's - as well as some 4-8-4's that are not operable (being restored, undergoing new FRA recertification or waiting to be bought) but have a large following. With the publication of information about the importing of a couple Chinese 2-10-2's into the United States we thought that this would be a good opportunity to compare these examples of the last big dual purpose steam locomotives that operated regularly in China to their American cousins. The chart is arranged from the lightest engines to the heaviest - following the Chinese locomotive. The data on this chart is a compilation of information from Steamlocomotive.com. Or in some cases from the individual organizations stated online specs. Pulled last regularly scheduled mainline steam train in China. Currently used for special operations on the Iowa Interstate Railroad Limited. Stored near Sugercreek, Ohio waiting to be moved into the Age of Steam Roundhouse following completion of its construction. Stored serviceable on a siding in Richland, Washington (Reading Railroad Online). Operational. Based out of Amtrak's Los Angeles Locomotive Facility. Full list of current specs here. Angeles Locomotive Facility. Full list of current specs here. * Figures for this locomotive are preliminary and have been converted from Metric to American Standards, these figures have also not been confirmed. While comparing this data it is relevant to know that these are not state of the art steam locomotives of the 1970's or 80's - they are more closely likened to state of the art 1930's. Remember the Chinese built these as copies to Russian 2-10-2's, who built their engines as copies of American 2-10-2's from the 1930's. While most of these engines have redundant systems they have sometimes been under engineered with small axles, small rods and bearings. In addition the ride is very rough as the drivers are not cross balanced and the engines tend to hunt and bounce on strait track. The last QJ built was number 7207 on December 21, 1988 - thus ending the production of 150 to 250 QJ's per year. More information will be available soon. With the advent of American Operators importing these engines into the US for use on tourist roads we thought it would be interesting to include specs on these engines. ** There are several different published numbers available for the 2900's, and perhaps it is best if we let Bob Kittel (SBRHS CMO) address this oddity - "It is interesting that the Santa Fe 4-8-4s, all four classes, have the same stated tractive effort of 66,000 lbs. The computed tractive effort is based upon a coefficient (0.85). This coefficient is the combination of Mean Effective Pressure and a friction term. The friction term is set to '1.0' when roller bearings are specified, which it has now. If you do the math work on figuring tractive effort for the 51 class then you come up with 71,719 lbs of tractive effort (TE). This of course after using a different coefficient of friction calculation because of the roller bearings - 66k was the TE as built with friction bearings in 1927, in 1941 it was modernized with roller bearings. The RRs didn't use the different methods of figuring and only used .085 for friction bearings for all engines. If you look at the tractive effort of a 2900 as 66K (as stated in some books) this is ridiculous, 2900's weigh 32,000 pounds more than the 51 class and has higher steam pressure and more horsepower. The tractive effort figure then for 2900s comes to around 86,922 TE. This is why I said that 66K TE for 2900s is crazy." *** Originally built for C&O with booster, however Ross Rowland removed the booster from his Reading 2100 for use on the 614 and never installed it. The result was that both the Reading 2100 and the C&O 614 do not have boosters today.